Looking for something new and fresh to inspire your menu? This recipe, created in partnership with our friends at Fruits & Veggies More Matters, is a surprising and delicious mix of zucchini, fresh strawberries and shrimp, tossed in a light Asian dressing. 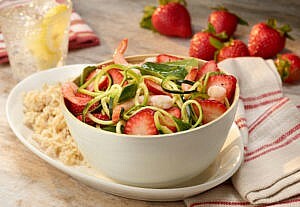 At only 170 calories and with 14g of protein and 1.75 cups of fruits and veggies, this dish is a whole lot of healthy. But, where are the noodles? Right there! The zucchini are cut into “noodles” which can be done lickety-split with a spiralizer (an inexpensive gadget for noodling up fruits and veggies). Check out the video from The Produce Mom to see it in action! In a small bowl whisk together dressing ingredients. Using a spiralizer*, make zucchini noodles. Slice strawberries. Place all salad ingredients in a large bowl. Add dressing and toss. *A spiralizer is an inexpensive gadget that makes spiral noodle-like strands from vegetables and fruits.